To address the shortage of social workers prepared to deliver culturally competent, evidence-based, services to children and adolescents from infancy to seventeen years old, the National Center has developed the “Upstream Model,” also referred to as the full educational model, of social work education. The model moves trauma education “upstream” from community agencies into the social work curriculum. The National Center is working with an increasing number of schools of social work that are implementing the model which provides students with coursework, training in an evidence-based trauma treatment (EBTT), and field instruction in the EBTT. 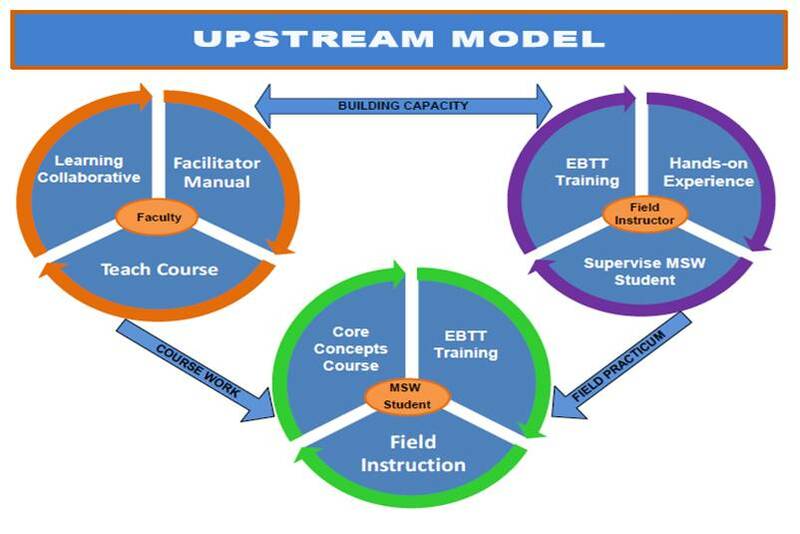 The “Upstream Model” builds student and practitioner capacity to deliver evidence-based practices, and faculty capacity to deliver trauma-informed coursework. Partner schools (listed here) receive continuous support from the National Center which builds their capacity to provide students with the latest trauma knowledge and an understanding of trauma’s developmental impacts across the lifespan. The National Center may also assist schools in developing a trauma track. Partner school faculty are prepared to teach a Core Concepts course by participating in a national learning collaborative and training in problem-based learning. Partner schools receive periodic site visits from National Center project team members to discuss progress and next steps. Faculty can learn more here. Students attending a school that has implemented the full educational model take Core Concepts of Child and Adolescent Trauma, a clinical course that provides them with a foundation in trauma knowledge (read more about the Core Concepts curriculum here). They receive training in an evidence-based trauma treatment (EBTT) and will be placed at an agency that delivers the same EBTT. Students may also participate, with classmates, in consultation calls with the EBTT developer/trainer. Students may read more about the benefits of the National Center’s educational program here. Participating community agencies benefit from their partnership with schools of social work. They receive interns who are trauma-informed and trained in an EBTT, some of whom may end up working for the agency full-time after graduation. Participation in the model also helps agencies prepare their workforce for evidence-based practice. Field instructors may receive a two-day (or as prescribed by treatment method) training in an EBTT and seven to twelve months of twice monthly consultation calls from the treatment developer. The training prepares field instructors for supervision of a student trained in the same evidence-based approach, and for treatment delivery. As agencies develop their readiness to implement EBTT agency-wide, they may also receive a consultation from the National Center in conjunction with the National Implementation Research Network (NIRN). Is your school of social work interested in replicating all or part of the Upstream Model? If so, contact us to take the first step. The National Center will assist you in connecting with local community agencies that deliver EBTT to children and adolescents and their families, and introduce you to current partner schools that have implemented the model. Full partner schools also receive on-site consultations from members of the National Center project team and are listed on the National Center’s website here.